Post-traumatic headache is the most common symptom after mild/moderate brain injury. Similar to the characteristics of naturally occurring headaches, it is multi-faceted in nature and includes neurophysiological, psychological and social aspects. Consequently, headache has an enormous impact on the quality of life of the sufferer. Effective headache treatment has a focus on all aspects of the pain and the needs of the individual. 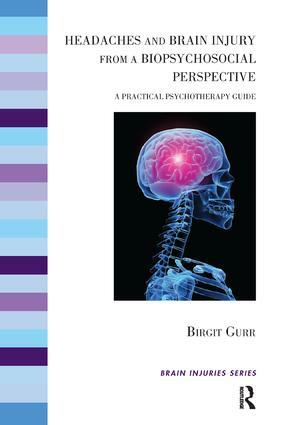 This book describes a cognitive-behavioural program which was developed as part of a research project in a brain injury service. It is based, firstly, on the evidence provided by the outcomes of this research project. The interested reader may study the literature associated with this research for which the references can be found at the back of this volume. Secondly, this headache therapy guide is the result of clinical experience and the application of cognitive behavioural therapy to patients who experience complex difficulties following a brain injury.